Here’s a fun fact – did you know that Northern Germany borders both the Baltic Sea and North Sea!? Most people forget that the country has an extensive water border and thus, is home to quite a few islands. Living in Hamburg, the Prince and I are no more than a 2-hour drive from most islands! When deciding where to go for the Easter holidays, we didn’t want to stray too far from the Prince’s hometown of Kiel. I’d been begging to go to the island of Sylt for ages and we just so happened to book one of the last rooms on the entire island! While Sylt is officially part of Germany, it actually straddles the border of Germany and Denmark when looking at a map. Sylt, affectionately called the Hamptons of Germany (by me haha), is a resort island for the wealthy citizens of Northern Germany, especially the Hamburg region. Designer stores line the main streets and people flock to the island in hopes of a celebrity sighting. While most of the homes are vacation homes, Sylt is the most expensive place in Germany to buy a house. The average house goes for around $3,500 USD per square foot!!! Sylt didn’t actually appear as an island until the early 1300s and in its current shape, has only been around for 400 years. Unfortunately, the island is highly endangered and loses around 1 meter (40 inches) of shoreline a year. At one point, the island was actually split into two (only in 1962) and the area is still in danger of being cut off permanently. As of now, the only effective way to combat the land loss is through the dredging and depositing of sand. It costs about €10 million a year but should help the island combat land loss for at least the next three decades. ^^ When in doubt, just send your kids into the water in a snowsuit! It wasn’t particularly warm on the island but we managed to avoid all the rain Hamburg was getting, so I’d call that a win! Plus, we even got some sunshine!!! As you can see in some of the previous pictures, there were a bunch of surfers in the water using dry suits! I dipped my toes in the water but that’s about as far as I would get! Car: There is no bridge to the island. However, you can take your car over on either a ferry or train. This service costs around €80 round trip. Train: The easiest and cheapest way to reach the island. There are trains leaving Hamburg almost 20 times a day. Round trip tickets are around €30. Ferry: The ferry is only accessible from the Danish side on the island of Rømo (accessible via the autobahn). It costs around €85 for a car and up to three people. Plane: Because it is such an international location, there are flights from Munich, Zurich, Cologne/Bonn, Frankfurt, Basel, Bern, Hamburg, etc. The airport is even big enough to hold Boeing 737s! While there are lots of small towns and villages on the island, the Prince and I decided to stay in Westerland, the main city. We were close to the train station yet the public transportation was good enough that we were able to travel around the entire island with no issues. Bring lots of layers! The wind on the island is insane. If possible, avoid bringing your car over. The public transportation is fantastic and the car is just an added expense. (However, the Prince and I did the math and it would make sense to bring a car if you’re headed over for longer than a weekend!). Stay in Westerland if you want to be in the middle of everything. Stay in a local town or village if you want to be a bit more remote and authentic. If you decide to get a hotel in Westerland, I can’t begin to recommend this hotel enough! When feeling ambitious, there are lots of bikes available for rent! The holidays book up FAST on the island! Make reservations at least 2-3 months in advance. Do you have a favorite island paradise? Share it in the comments below! It looks amazing there! I’ve never even heard of it before, but it sounds so interesting. It’s crazy that they have to dredge so much sand there and how much it’s loosing each year. It sounds like you had an amazing trip! 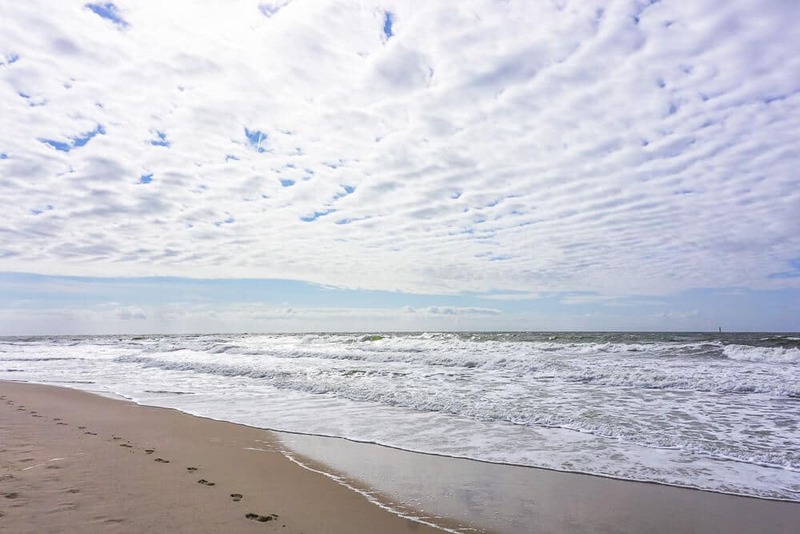 We’ve always wanted to visit Sylt but it’s always fully booked! I’ve heard that Spiekeroog is very nice too, have you ever been? Thanks for your tip, if we finally get to go, we’ll be following your recommendations! They are covered seats! Adorable, right? It’s crazy how expensive it is considering it may not exist in the next few decades. I’m glad you guys had a good time! I never think of Germany having islands. That place looks amazing! I hope the sand deposits work and maintains it! I know, right?! I would have never guessed Germany!!! Most people don’t even know that Germany has islands/beaches!